Are you a self-confessed DIY nut, but could benefit from a refined approach? Here at Blueprint Joinery, we are happy to share with you our top 10 DIY tips, meaning that the next time you install a set of LPD doors or new staircase parts, they will look exactly how you imagined. It might sound a bit boring but a successful DIY project, particularly a large one, requires good planning. From the best time and day to start the project to enable paint drying, to being equipped with enough nails. At Blueprint Joinery, we are proud to only offer the finest materials available on the market. This means that every set of LPD doors or staircase parts that we sell has been finely handcrafted. If you try to cut corners by settling for sub-standard materials, the chances are that your project won't withstand the test of time. If you are unsure whether two tins of paint are going to be enough, buy three. Likewise with any other item that you will need, just make sure that you keep your receipt so you can return unused items. It works out a lot better than multiple trips to the DIY store that will eat into your project schedule! Okay so this one won’t really help you to get things done any sooner or easier but it is great to show yourself and friends the success of your project. If you need to put something back together or rewire something, taking a before photo can also be crucial in getting it back to the original state! If you have a toolbox, make sure you put your tools away straight after use so you don’t spend unnecessary time looking around for things. It is also better from a health and safety point of view, if you’ve ever knelt on something sharp, you know why it is a good idea! This seems like an obvious one, but sometimes you have a few days of good weather and it motivates you to start an outdoor project. Then a few hours in, with fresh paint/sealants drying the heavens open and your hard work is undone. So even if you think it is certain to stay nice, check the weather forecast, just in case. If a project is going to take approximately five hours, make sure that you have at least eight available! Very few projects stick to timescales for one reason or another and you don’t want to be stuck with a half-done job if you are not going to get time to finish it for a while. If you’re not sure how to do a certain DIY task then get onto YouTube to find out. There are so many great video tutorials available for all kinds of DIY projects. Safety should always come first so don’t cut corners to try and get things done quicker. Make sure you have all of the right safety equipment like gloves and goggles as necessary. 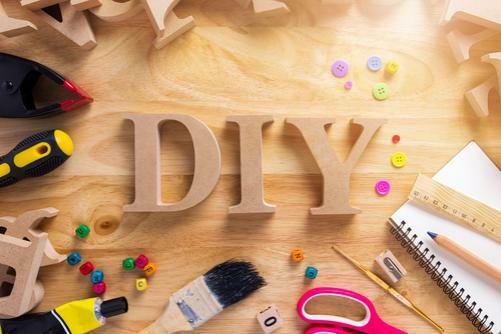 Putting too tight a deadline on yourself or taking on too big a challenge will no doubt end in you getting stressed out, so be realistic with your DIY projects and try not to get worked up.